Is Something Ominous in the Cards? For the first time in history, ALL the major central banks are printing money. One of two things will occur. If they continue to print, their respective currencies will lose their purchasing power, and we'll have inflation or even hyper-inflation. If the central banks pull back on their printing, we'll have crashing markets and a world depression. This is the problem with creating ever more debt. Ultimately, the debt owns you, and the compounding process renders the debt situation unsustainable, which is what the CBO has just warned us about. The underlying problem is the common man's desire for profits -- his insatiable greed. Eventually, greed becomes its own worst enemy. To "grow" the economy, you must have expanding credit. Eventually, credit, when compounded, becomes unsustainable -- particularly when a nation can print all the money it wants out of thin air. Thus, the acceptance of fiat money spells the eventual death of an economy. Below I show a chart of JP Morgan, the biggest bank in the US. Here we see a textbook head-and-shoulders pattern that I think should break down. JPM was just hit with a huge $900 million fine, based on its notorious trader, known as the "London Whale." Another choice place I'm watching is the US dollar. 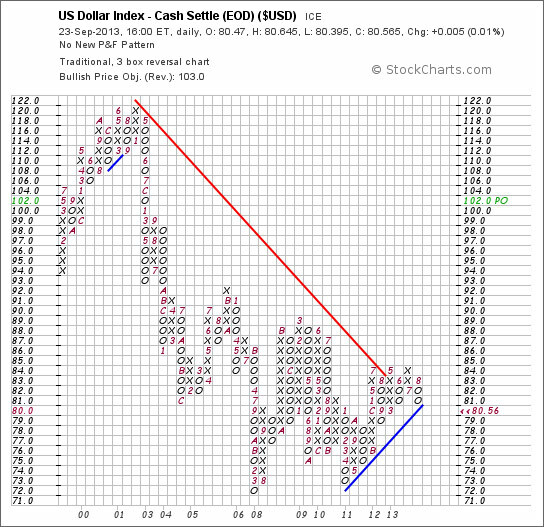 The US dollar has dropped three boxes on the P&F chart. If the dollar hits the 79 box, it will have issued a clarion sell signal. So at any rate, I've got my eye on the dollar. Here's something that bothers me. Below we see the D-J Industrial Average. 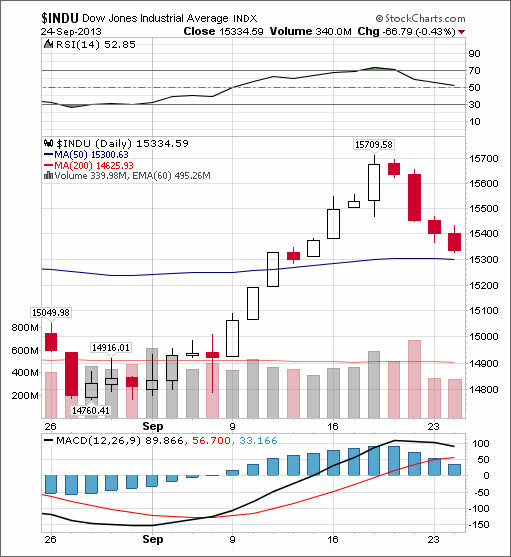 As you can see on the chart, over the last four trading sessions, the Dow has declined each day. 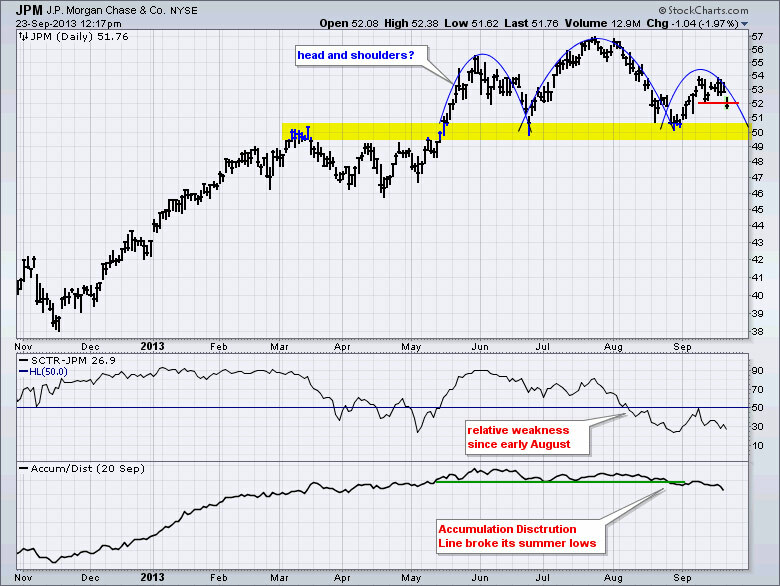 Is this the sign of a market top that is subtly breaking down? If this declining action continues, I'll really begin to wonder whether something ominous is in the cards. To read the rest of Richard Russell’s Dow Theory Letters and receive daily updates, click here to subscribe.